Transport phenomena in plasmas are the relatively slow processes of particle momentum and energy transport systems in a state of mechanical equilibrium. In contrast to neutral gases, these phenomena in plasmas are greatly influenced by self-consistent fields, in particular electric fields. These can produce particle and energy fluxes, in addition to those generated by the inhomogeneity of the plasma composition and temperature. As a result, the physical effects accompanying transport phenomena in plasmas are far more numerous and complicated than those in neutral gases, and the solution of corresponding problems is more difficult. The effects, however, are usually far more interesting and sometimes surprising. 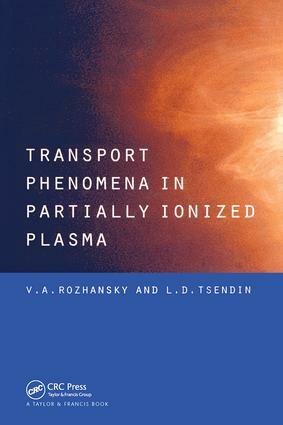 This book presents a systematic survey and analysis of the main mechanisms of transport phenomena in plasma and gives examples of gradually increasing complexity to illustrate these mechanisms and the relationships between them. The author pays special attention to the analysis of experimental measurements and considers the relevant processes analytically as well as qualitatively. The majority of problems dealt with in this book are of considerable practical interest, and the phenomena described often determine the main characteristics of processes and devices. Transport Phenomena in Partially Ionized Plasma will be of interest to researchers who need to know the properties of real, specific systems, as well as to engineers and advanced students in the physics of plasmas, semiconductors, various types of gas discharges and the ionosphere. Introduction. Transport Equations. Sheath Structure and Effective Boundary Conditions for Plasma Equations. Transport Processes in the Absence of Magnetic Field. One-Dimensional Diffusion in a Magnetized Plasma. Diffusion of Unbounded Plasma in Magnetic Field. Diffusion of a Bounded Weakly Ionized Magnetized Plasma. Thermodiffusion in Magnetic Field. Influence of Net Current through Plasma Inhomogeneity on its Evolution on Absence of Magnetic Field. Inhomogenieties in Currentless Multispecies Plasmas with Great Distinction in Partial Temperatures. Evolution of Magnetized Plasma in Presence of Net Current. Electron Energy Transport.